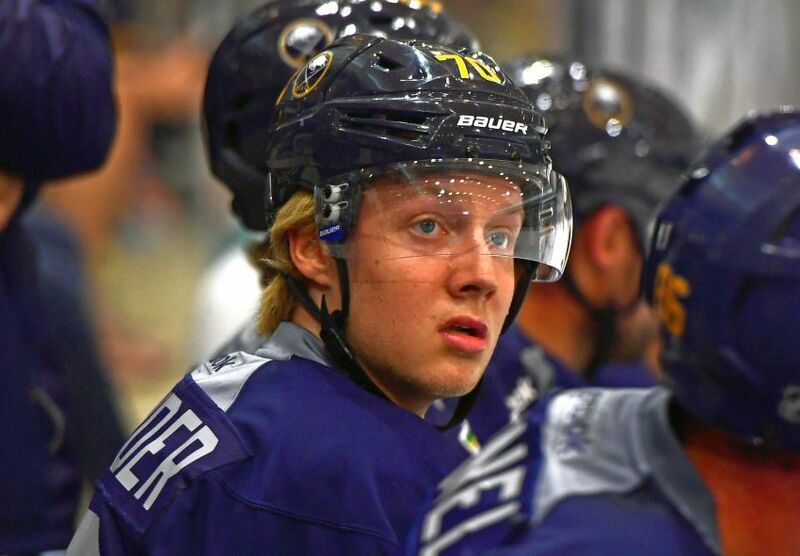 ROCHESTER – A year ago, Buffalo Sabres prospect Alexander Nylander wowed as a 17-year-old at the World Junior Championship, showcasing his dynamic skills while leading Team Sweden with four goals and nine points in seven games. So naturally, the expectations this year for Nylander, a youngster many believe was the most talented player in the 2016 NHL Draft, are extremely high. Not only is Nylander a year older, the eighth overall pick has spent the first three months this season competing against men in the AHL. Barely 10 minutes into Monday’s opener in Montreal, Nylander grabbed a loose puck in the left circle, cut to the slot and scored the tournament’s first goal. In the final minute of Sweden’s 6-1 demolishing of Denmark, Nylander got knocked down behind the net, quickly got up and redirected a shot in near the crease seconds later. Nylander’s penchant for scoring highlight-reel goals is well-known around Buffalo and Rochester. Shortly after the Sabres drafted him June 24, he wowed a development camp crowd inside HarborCenter with a few nifty shootout scores. His hands are among the quickest and softest in the world. But slick skill, of course, doesn’t always translate into success at the next level. The AHL’s youngest player – Nylander doesn’t turn 19 until March 2 – has “been good for us at times,” Lambert said. The 6-foot-1, 185-pound Nylander has five goals and 17 points in 29 AHL games. The rookie hasn’t gone more than two contests without a point. Nylander’s biggest adjustment has been learning how to compete against grown men, Lambert said. In a hallway outside the Rochester dressing room before he left for the world junior championship Dec. 19 – “It’s always really an honor to put on that jersey,” Nylander said – he reflected on his adjustments to pro hockey. Nylander said his family has helped him acclimate to the AHL. His brother, William, a rookie with the Toronto Maple Leafs, was arguably the league’s best player last season, scoring 18 goals and 45 points in 38 games. Their father, Michael, who compiled 679 points in 920 NHL games, briefly played in the AHL in 2010-11, ironically, for Rochester. “It’s crazy,” he said of his father playing for the same team only six years earlier. Their recent experiences have been valuable to Nylander. The reeling Sabres, losers of four straight games (0-2-2), resume their season tonight in Detroit against the Red Wings following a three-day Christmas break.